The annual Earth Hour is approaching us! Don’t forget to participate in Earth Hour and turn off your lights for one hour on March 31, 2012 (tomorrow) from 8:30 p.m. to 9:30 p.m! Turn electronics and appliances off! This means coffeemakers, toasters, computers, video games, etc. I would have never thought of this one — but fill up your freezer! Did you know that an empty freezer uses up more energy than a full one? Another interesting tidbit — using the dishwasher is fine! An energy efficient dishwasher will not only use half the energy but also one-sixth the water than if you were to wash dishes by hand. Are you participating? Would love to hear your stories/see pictures! Last year I marinated for a BBQ the following day (YES, in the darkness… I only had one candle on) and had so much fun sitting as a family and talking about old memories. You can read all my previous Earth Hour related posts by clicking here. 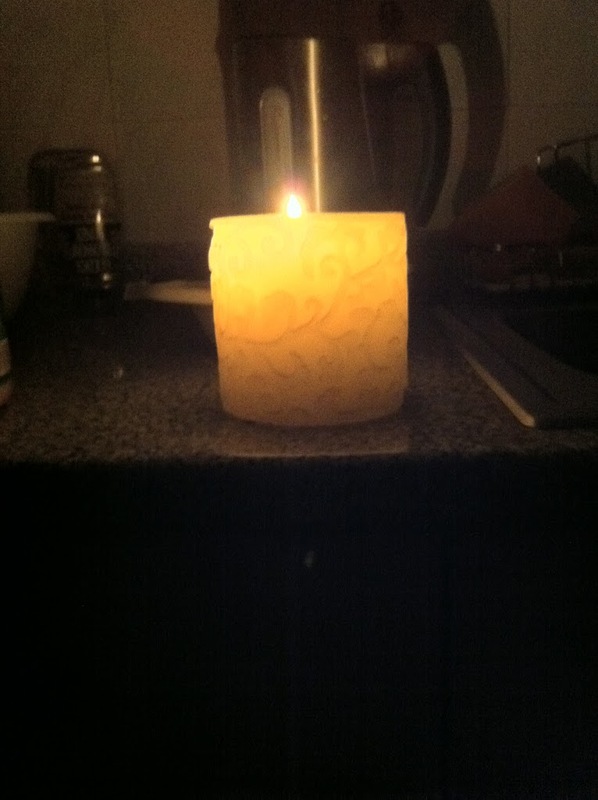 The candle below was the only “light” we had on in our whole house during Earth Hour earlier today. And you know what? It was great. Not only because it felt nice to do our small share for our planet… but because all four of us sat around in the family room (in the dark) and talked about old memories and such. I mean, come on, how often do you do that? It was like for an hour, everything else was put on a stand-still, and… it was just nice. So did you take part in Earth Hour? What did you do? I’d love to hear about (and even see pictures) if you posted some. Don’t forget to take part in Earth Hour tomorrow March 26th, 2011 at 8:30 P.M.
What’s Earth Hour you ask? It started in 2007 in Australia (and I’ve been blogging about it since 2008!) and basically what happens is people turn off their lights for one hour. What for? Well, Climate change. A year later, it became a global thing. So tell me, how do you plan on participating in Earth Hour? Something so small, but every little thing helps to raise awareness for such a major problem we are all facing with the climate. This is something similar to what Google did two years ago, and I blogged about that too. Read that here. This time though, people got to choose to participate in it themselves through their social networks. Facebook had something similar. This was a great thing for those people who want to do something for the cause, but don’t know what…. just by raising awareness. Last year, we closed off all of the lights and turned off all the unnecessary electronics and left our house to go to a public place, but this year we had guests over so we could not shut off everything. Did you guys participate this year? I did not use my computer for several hours and had it turned off (purposefully) and my cell phone was turned off (not on purpose… it just kind of happened), which are TWO major things for me! Read my blog posts from the past two years on Earth Hour here (2009) and here (2008). World Wildlife Fund is asking individuals, businesses, governments and organizations around the world to turn off their lights for one hour – Earth Hour – to make a global statement of concern about climate change and to demonstrate commitment to finding solutions. Earth Hour originated in Sydney, Australia in 2007, when approximately two-million people participated in the local event by turning off their lights. In 2008, the event went global, and over 50-million people worldwide participated! “Up to 30 million people were expected to have switched off their lights for 60 minutes by the time “Earth Hour” –which started in Suva in Fiji and Christchurch in New Zealand — has completed its cycle westward. Toronto’s CN Tower and its surrounding skyline was also expected to be in darkness for the hour. What a neat idea..I love it. It’s for such a good cause and it will prove that little things add up to make a big difference. Most people do not even realize yet how big of a deal global warming actually is and what its consequences will be in the future.